i-Touch V21 Desk Top Kiosk with 15'' screen - Future Generation Kiosk Products. - Future Generation Kiosk Products. This attractive Desktop Kiosk, compact in design includes a fully integrated open architecture PC. 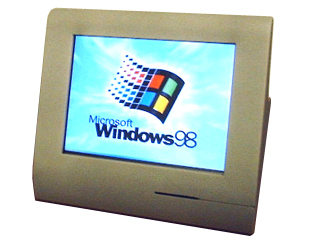 Although unusually shaped this Kiosk is constructed using non-proprietary components, making maintenance no different to a standard PC. The ATX motherboard offers two PCI expansion slots, USB, Serial, Parallel and if required PS2 Keyboard and Mouse I/O ports. The rear peripheral cover is lockable to prevent unauthorised access. Its most important feature is that it's a portable, self-contained kiosk, designed for both desktop or wall mounted operation. - Dimensions: 430x340x380 mm (WxHxD). Weight: 13kg.